334 machines came under starter’s orders in Lima Monday 7 January, setting off on a short blast down the Pacific coast to Pisco, 102 of them being cars and it was Attiyah who struck while the iron is hot beating the Minis Sainz and Przygonski to Pisco. Rally legend Sebastien Loeb’s Peugeot delivered a crushing performance to win the 342km second day to San Juan de Marcona from Roma and Bernard Ten Brinke and Giniel de Villiers’ Toyotas as de Villiers moved into the overall lead over Ten Brinke, while French Dakar legend Stephane Peterhansel lost 20 minutes and Al Attiyah appeared to struggle for pace. 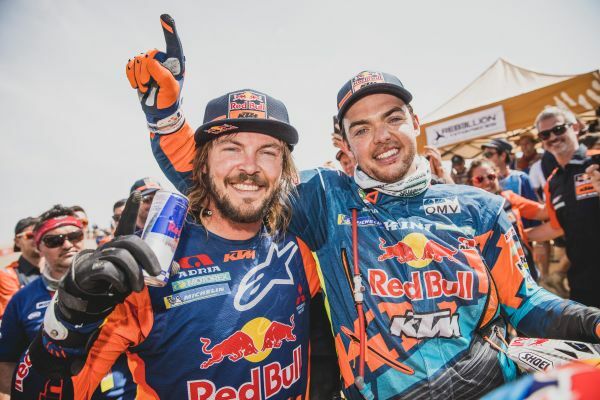 Wednesday saw a decisive 331km run Arequipa as leader de Villers and Sainz both hit rocks and lost significant time, Loeb and French frontrunner Cyril Despres’ Mini got lost and Ten Brinke struggled for pace as Peterhansel beat Al Attiyah and Przygonski to the stage win. The leaderboard was turned on its head with Al Attiyah leading Al Rajhi’s Mini and Peterhansel. Thursday's 405km stage to Takna, the first half of the marathon stage with no service assistance overnight, saw Al Attiyah defeat Peterhansel and Loeb in a battle of the giants as Peterhansel moved up to second overall while Ten Brinke lost several hours due to suspension damage. Friday's 345km dash to Arequipa saw Loeb take a compelling car victory over Al Attiyah, who tightened his grip on the overall race to 25-minutes over Peterhansel, Roma, Przygonski and Loeb at the midpoint before Saturday’s rest day. The second week started with the run back to San Juan de Marcona, where Loeb led Al Attiyah and Sainz home as Peterhansel lost 20 minutes, to leave Attiyah 36 minutes ahead of Loeb and Peterhansel overall. Monday’s seventh day around San Juan de Marcona proved dramatic as Loeb stopped for 40 minutes while Peterhansel, Sainz and Roma went on the attack, but fourth placed Al Attiyah consolidated his lead over Peterhansel, Roma, Loeb and Despres as Ten Brinke retired. 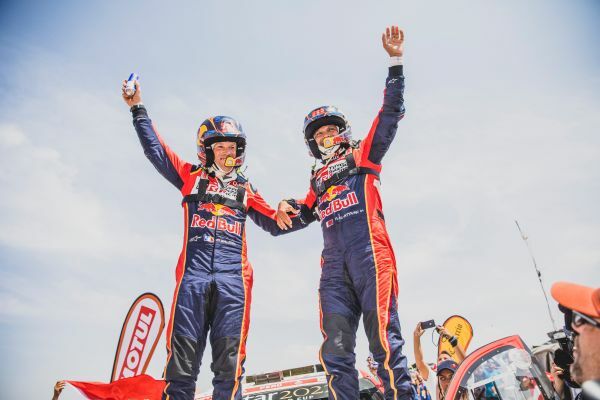 Loeb came from behind to beat Al Attiyah, de Villiers and Przygonski on Tuesday as Attiyah again stretched his lead to 46 minutes over the tussling Roma and Loeb. Wednesday’s penultimate 312km blast around Pisco saw Peterhansel retire after co-driver David Castera suffered a back injury, while Loeb and Despres lost time to leave Al Attiyah to take another day from Roma and de Villiers and opened his lead to a commanding 51 minutes as de Villiers moved up to 8th overall in his fight back from 40th. 137 bikes took the start as Spain’s Joan Barreda (Honda) took the day from Pablo Quintanilla (Husqvarna), US rider Ricky Brabec (Honda) and Adrien van Beveren (Yamaha). Tuesday was all about Brabec and his Honda until last year’s winner, Austrian Matthias Walkner (KTM) stole the win while Barreda led overall from Walkner and Brabec. Yamaha’s Marquis Xavier de Soultrait avoided navigation issues to win his first Dakar stage from Quintanilla and Argentine Kevin Benavides’ Honda on Wednesday as Barreda’s Honda stopped to leave Quintanilla in the overall lead over Benavides and Brit Sam Sunderland’s KTM. Brabec then led all the way to beat KTM trio Walkner, Aussie Toby Price and Sunderland on the first half of the marathon stage on Thursday, moving ahead of Quintanilla and Price overall. A close fought Friday saw Sunderland beat de Soultrait and Walkner after Sunderland was given time back for stopping to assist the injured Paulo Goncalves. That left Brabec, Quintanilla and Walkner in a close overall fight into the midway rest day. Sunday’s motorcycle race proved epic as Quintanilla moved into the overall lead ahead of Brabec and Price after Sunderland once again came from behind to beat Brabec, who ended third to Chilean Jose Flormino’s Honda. Quintanilla lost 20 minutes on Monday to see Brabec back into the overall lead over Price, van Beveren, Sunderland and Quintanilla, all within ten minutes of the lead. Tuesday started with a bang — quite literally for luckless leader Brabec, whose Honda blew its engine, leaving Walkner to lead home from Quintanilla and Sunderland to leave Price leading Quintanilla, Walkner and van Beveren overall. 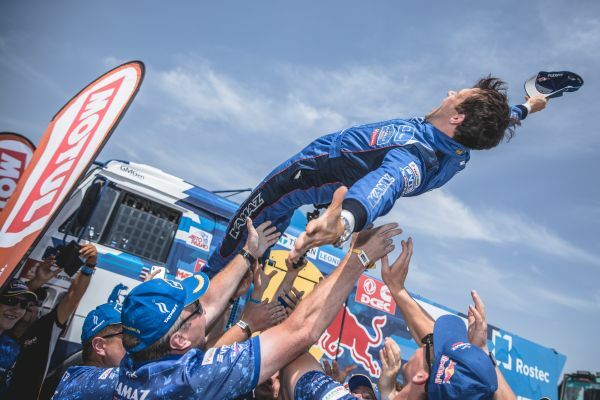 Russia’s Eduard Nikolaiev’s Kamaz led the 41 truck starters over the first week, beaten only on Wednesday by teammate Andrey Karginov day 3, but Karginov was later disqualified for not stopping after bumping a spectator. Week 2 saw a busy week as Gerhard de Rooy fought back in his Iveco to win a couple of stages before Nikolaiev lost an hour Tuesday as teammate and countryman Dimitry Sotnikov took the day to move into the overall lead, but Nikolaive bounced back Wednesday to take a 58 second lead into the final day over Sotnikov. Argentine Nicolas Cavigliasso totally dominated the quad race, winning nine of the ten stages to beat countrymen Jeremaias Gonzales Ferioli, who won the other stage, and Gustavo Gallego in a Yamaha clean sweep. Chilean Francisco Lopez Contardo meanwhile took side-by side honours after a consistent race saw him overcome the similar Can Ams of Spaniard Gerard Farres Guell and Brazil’s Renaldo Varela.